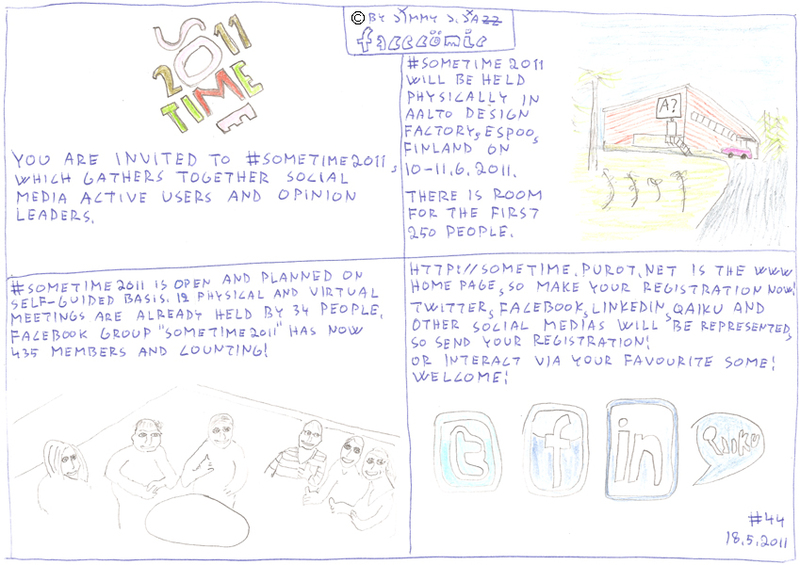 You are invited to #SomeTime2011 , which gathers together Social Media active users and opinion leaders. #SomeTime2011 will be held physically in Aalto Design Factory, Espoo, Finland on 10-11.6.2011. There is room for the first 250 people. #SomeTime2011 is open and planned on self-guided basis. 12 physical and virtual meetings are already help by 34 people. Facebook group SomeTime2011 has now 435 members and counting! http://sometime.purot.net is the WWW home page, so make your registration now! Twitter, Facebook, LinkedIn, Qaiku and other Social Medias we be represented, so send your registration! Or interact via you favourite SoMe! On the Facecömic number 47 I'm also inviting you to my Facecömic Work Shop, which will be held at "Engine Room" on Saturday 11.6.2011 at 11 a.m. and it lasts one hour.